Lake, Robert 2017. Spinning Popular Culture as Public Pedagogy. p. 25. Dowd, Timothy J. Ryan, Trent and Tai, Yun 2016. Talk of Heritage: Critical Benchmarks and DIY Preservationism in Progressive Rock. Popular Music and Society, Vol. 39, Issue. 1, p. 97. Lubell, Gabriel 2016. New Critical Perspectives on the Beatles. p. 95. Griffiths, Dai 2012. After Relativism: Recent Directions in the High Analysis of Low Music. Music Analysis, Vol. 31, Issue. 3, p. 381. Brumm, Henrik 2012. Biomusic and Popular Culture: The Use of Animal Sounds in the Music of the Beatles. Journal of Popular Music Studies, Vol. 24, Issue. 1, p. 25. Biron, Dean 2011. Towards a Popular Music Criticism of Replenishment. Popular Music and Society, Vol. 34, Issue. 5, p. 661. Etlinger, Sarah A. 2011. Beyond the Music: Rethinking Sgt. Pepper’s Lonely Hearts Club Band. Volume !, p. 253. Wagner, N. 2003. 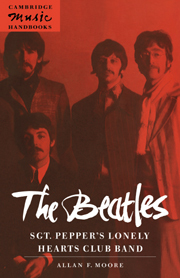 "Domestication" of Blue Notes in the Beatles' Songs. Music Theory Spectrum, Vol. 25, Issue. 2, p. 353. Sgt. Pepper's Lonely Hearts Club Band (1967) represents the highpoint of the recording career of the Beatles. This is the first detailed study to be made of this or any other such album, and it demonstrates how serious discussion of popular music can be undertaken without failing either the approach or the music. Dr Moore considers each song individually, tying his analysis to the recorded performance on disc, rather than the printed music. He focuses on the musical quality of the songs and the interpretations offered by a range of commentators. He also describes the context in which the album was written - both within the career of the group itself and within the development of popular music globally, both before and since.